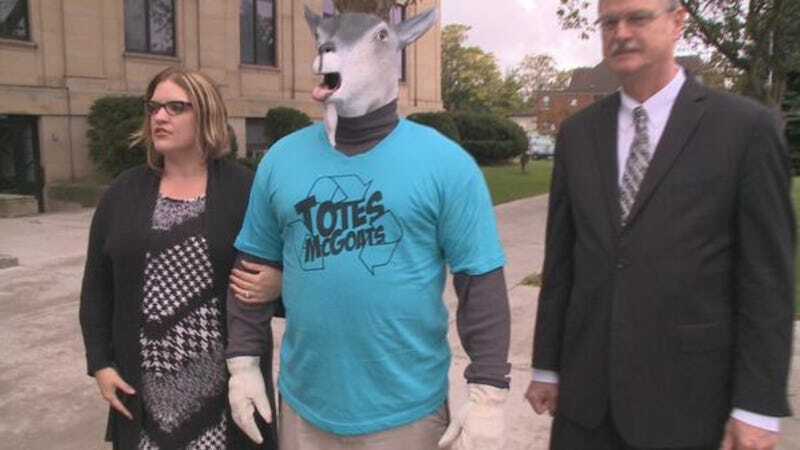 Buffalo, New York's NBC affiliate brings us the news today that the Niagra Falls Solid Waste Education & Enforcement Team is introducing a new pro-recycling mascot: a horrifying goat-person; a satyr, the drunken, lustful god of the woods. The best way "to get kids more involved in recycling" is the same way to get me more involved in recycling: pure, unbridled fear of goat-people. Wondering if Twitter had some good reactions? The answer is: Totally, yes, it did. Somehow, someone snuck a Left Shark reference in there. But soon the laughter will stop. There will be stories kids tell each other in the dark at sleepovers, or while parked out on lover's lanes, or out on the Maid of the Mist: if you don't separate your bottles and cans and old papers from regular trash, Totes McGoats will come for you. At least it's only a weird guy in a tiny goat mask..for now. Stay ahead of Totes McGoats by tracking his movements on Twitter.